L-Tron Corporation is teaming up with Papaya Restaurant in Henrietta to host Cuddle Bear Happy Hour event for the RPD. Please join us at our upcoming Cuddle Bear Happy Hour on April 11th. 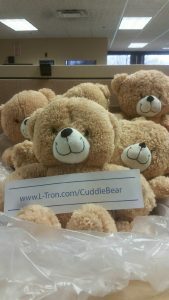 L-Tron has been running an ongoing Cuddle Bear drive throughout the month of March. The Cuddle Bear drive supports the “Books and Bears” program created by Mayor Lovely Warren in 2014. The goal of this program is to provide Rochester Police Officers with teddy bears and books, that they can give to children they meet on traumatic calls. This builds trust in the police force and allows officers to establish a rapport with the children. The program also encourages reading and learning, as every bear comes with a matching book. L-Tron believes strongly in giving back to the Rochester community. So far, the drive has raised over $1,900 towards the purchase of Cuddle Bear sets. Usborne books and the Jack Foundation are also contributing through Cuddle Bear set donations. On April 11th, Papaya Restaurant at the Marketplace Mall is holding a happy hour event in support of the Cuddle Bear drive. 50% of all drink purchases will go directly towards the purchase of book and bear sets. The happy hour will run from 5pm-10pm. Please stop by to show your support, and spread the word via social media. Visit www.L-Tron.com/CuddleBear to donate now!